Jen Rhines' Olympic team streak was broken this summer, when she was unable to compete at the US Olympic Trials due to a stress fracture in her foot. 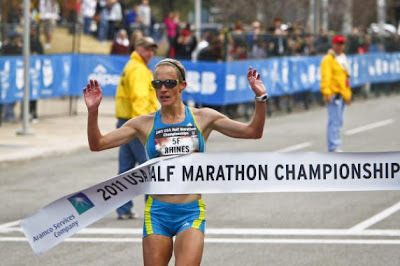 She was hoping to make her fourth consecutive US team, after competing in 2008 (5000 meters), 2004 (marathon), and 2000 (10,000 meters), but that dream was sidetracked by the injury. After rehabilitating her injury this summer, Rhines has tested the foot in two low-profile races in California near her Mammoth Track Club training base: (1) on August 26th she won the End of the Summer Fire Run in San Diego, running that 4-mile course in 21:41 (5:25 per mile pace), and (2) on September 8th Jen won the Grape Day 5K in Esconidido, coming home in 16:31 (5:19 pace). Confident that her foot and fitness were where they needed to be, Rhines has entered Monday's Tufts Health Plan 10K for Women which is serving as the US 10K Championship race. Rhines last ran this event in 2010, when she finished 3rd (32:16), behind Molly Huddle (32:00) and Genoveva Kigen (32:04). A short list of Jen's career highlights include: five individual NCAA championships while running for Villanova (3 outdoor 5000s, 1 indoor 5000, and an individual title at NCAA cross); four top-30 finishes at World Cross (including two top-20 finishes); three USA olympic teams at three different distances (5000, 10,000, and marathon), a USATF 10,000 meter national champion; three USA 15K national titles; a US Half-Marathon championship title, two top-10 IAAF World Championship 5000 meter finishes; a sub-15:00 5000 meter PR; a sub-2:30:00 marathon PR; and a world top-10 ranking at 10,000 meters.